The best memoirs take you inside a life completely unlike your own. That’s what Shulem Deen does so effectively in his personal tale of transformation. 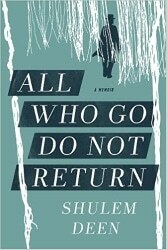 In All Who Go Do Not Return, he tells of his life as a strict orthodox Jew and his painful metamorphosis into a secular individual. It’s an astonishingly powerful testament to the power of belief and individualism. Raised as an orthodox Jew, in the Satmar tradition, Deen rebelled a bit as a teen and chose to join the more restrictive Skver sect, eventually moving to New Square, New York. This town of about 7,000 individuals is exclusively devoted to followers of the Skver Hasidic movement. Rigorously isolated from modern society, forbidding the use of any modern media or non-Hasidic books and requiring strict traditions of dress, grooming, food and marriage, the town is an island of authoritarian Hasidism. It was in this environment that Deen exhaustively studied the Torah, adjusted to his arranged marriage and raised five children, behaving like a model Skver all along the way. But several years after moving to New Square, he began to experience doubts, sneaking looks at forbidden books and movies, watching television and eventually venturing onto the Internet where he started a blog critical of the Hasidic life. Initially his skepticism and illicit behaviors were kept completely secret, but eventually others in the community became aware of his misdeeds and it was only a matter of time until he was expelled. Deen’s writing is consistently compelling, successfully capturing the emotional upheaval that accompanied his transformation. The work is all the more impressive given that despite his residence in the most populous metropolitan area in the US, English really isn’t his primary tongue, having been raised and educated in an environment where Yiddish and Hebrew were strongly favored. While he is clearly critical of strictly Orthodox Judaism, his account is really quite balanced and he consistently avoids demonizing or ridiculing those who still believe. What’s really most fascinating about his account is revealed in the title. There really was no going back. Once he had opened the door a crack, there was very little he could do to stop the process. I suppose it makes sense, the more restrictive and elaborate a religious structure is the more likely it is that a gentle breeze will cause it to start tumbling down like a house of cards. For Deen, all it took was a single step toward skepticism and there was no returning. He vividly describes his often agonizing descent into disbelief as he started disobeying Hasidic taboos and also convincingly explains the inevitability of it all. What was he supposed to do, just stop thinking what he was thinking? How much should you sacrifice for your beliefs? Is being true to your beliefs really worth it? I don’t think Deen actually answers these questions, but he provides plenty of food for thought. In the end, All Who Go Do Not Return is a consistently compelling account of one man’s religious journey from one extreme to the other. Highly recommended.